It’s a jungle out there. Trying to get the attention of your clients and prospects can be especially hard even on a good day. You can’t leave anything to chance. That’s why companies turn to Classic Business Solutions for comprehensive yet cost-effective marketing solutions. Stay in contact with your clients, generate new leads and increase business overall. An effective marketing campaign works best when print is used with other media. Consumers lives are increasingly online. Social media describe what they do, Google will help them to find whatever they need, YouTube to watch the newest videos and sites such as Amazon to buy the products on their wish list. Paper is now an ideal way to get readers online as these technologies form a bridge between print media and a brand’s online presence. It’s a jungle out there. Trying to get the attention of your clients and prospects can be especially hard even on a good day. You can’t leave anything to chance. That’s why companies turn to Classic Business Solutions for comprehensive yet cost-effective marketing solutions. Stay in contact with your clients, generate new leads and increase business overall. Programs can include such components as redesigning your marketing materials or creating a new logo or website. Classic is also a leader in designing cutting-edge tradeshow graphics and promotions that will get people talking to you instead of walking by you. 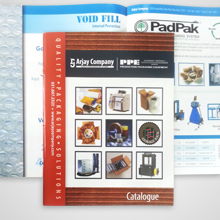 For a large distributor of waterproofing materials, Classic implemented a direct mail campaign, upgraded all of their marketing materials (marketing folders, line cards, website, stationery) and developed interesting and effective promotional products, greatly improving their overall exposure, helping to increase sales.